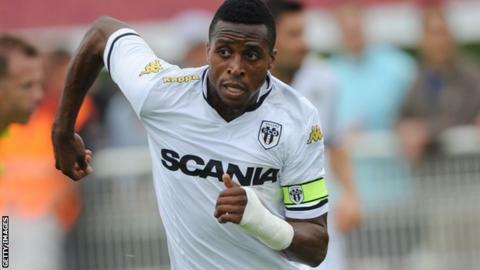 Newly promoted Championship side Bristol City have signed striker Jonathan Kodjia for a fee of about £2m from French side Angers SCO. Kodjia, 25, scored 15 goals in 29 games in Ligue 2 last season, helping the club to promotion to the top flight. The Frenchman collected last term's Ligue 2 Player of the Year award. "Jonathan has great pace, has scored some fantastic goals, and will fit into the young group we already have," said manager Steve Cotterill. Kodjia has signed a three-year deal with the option of a further 12 months.